Hong Kong Health Check & Medical Diagnostic Group Limited and its subsidiaries (Hong Kong Health Check Group) provides one-stop comprehensive and quality medical diagnostic services with advanced imaging technology and experienced medical and healthcare professionals. 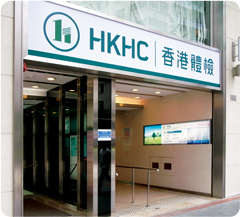 With Hong Kong Health Check Group’s over 10 years professional management experience, Hong Kong Health Check Group currently has a total of 9 service centres conveniently located in Central, Causeway Bay, Jordan, Mong Kok, Shatin, Sheung Shui and Yuen Long. Our flagship centre located at Nathan Square, No. 348 Nathan Road in Kowloon occupies a floor space of 20,000 square feet. Hong Kong Health Check owns laboratory to supplement its health check services. The laboratory has the HOKLAS accreditation issued by Hong Kong Accreditation Service (HKAS), an identification and recognition of competent testing and calibration laboratory in Hong Kong. Hong Kong Health Check is one of the private medical diagnostic centres which participate in the" Pilot Project on Enhancing Radiological Investigation Services through Collaboration with the Private Sector". Lead the community to a healthier lifestyle through advanced imaging and diagnostic technology and equipment; and to emerge as a market leader in the Asia Pacific region through professionalism and dedication. We are committed to promoting preventive healthcare through esteemed comprehensive periodic health checks to vastly improve community health. We are committed to serve the medical profession through imaging and diagnostic service of superior standard and quality, and collaboration with professionals both locally and internationally.